The fourth edition of this well-known text continues the mission of its predecessors – to help teachers link creativity research and theory to the everyday activities of classroom teaching. Part I (chs 1-5) includes information on models and theories of creativity, characteristics of creative people, and talent development. Part II (chapters 6-10) includes strategies explicitly designed to teach creative thinking, to weave creative thinking into content area instruction, and to organize basic classroom activities (grouping, lesson planning, assessment, motivation and classroom organization) in ways that support students’ creativity. Improved Organization -- This edition has been reorganized from 8 to 10 chapters allowing the presentation of theoretical material in clearer, more manageable chunks. New Material – In addition to general updating, there are more examples involving middle and secondary school teaching, more examples linking creativity to technology, new information on the misdiagnosis of creative students as ADHD, and more material on cross-cultural concepts of creativity, collaborative creativity, and linking creativity to state standards. 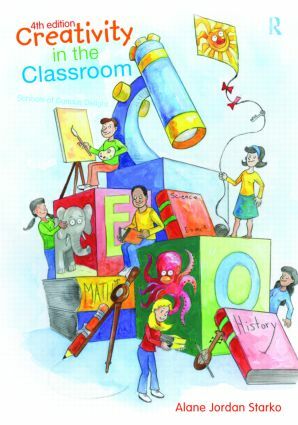 Pedagogy & Design – Chapter-opening vignettes, within-chapter reflection questions and activities, sample lesson ideas from real teachers, and end-of-chapter journaling activities help readers adapt content to their own teaching situations. Also, a larger trim makes the layout more open and appealing and a single end-of-book reference section makes referencing easier. Targeted specifically to educators (but useful to others), this book is suitable for any course that deals wholly or partly with creativity in teaching, teaching the gifted and talented, or teaching thinking and problem solving. Such courses are variously found in departments of special education, early childhood education, curriculum and instruction, or educational psychology.